Crunch Time: Can A Hip New Cereal Bar Help Kellogg's Revive Soggy Sales? 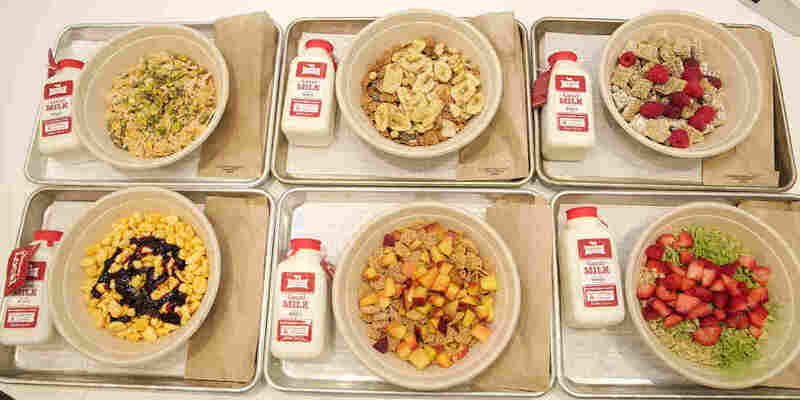 : The Salt Kellogg's has opened a cereal bar near New York City's Times Square. It's part of a strategy to energize a sagging cereal business by tapping into nostalgia while creating a refined dining experience. Crunch Time: Can A Hip New Cereal Bar Help Kellogg's Revive Soggy Sales? Various cereal options available at Kellogg's NYC cereal bar. The restaurant encourages experimentation, part of the company's strategy to challenge the conception of cereal as being only a breakfast food. To Sandra Di Capua, cereal is a Proustian affair. "I love Proust, and I love Proustian moments and memories," says Di Capua, citing the French novelist whose taste of a madeleine famously sent him on a journey of memory. "The delight that I see here, it goes back to when I had Froot Loops as a kid and watched Saturday morning cartoons." "Here" is Kellogg's NYC, a new cereal bar whose opening over the July Fourth weekend, in New York's Times Square, was overseen by Di Capua and restaurateur Anthony Rudolf. With this narrow store, outfitted in stark, farm-chic accents, Kellogg's is hoping to tap into diners' deep-seated nostalgia for cereal — and help give some new snap, crackle and pop to a soggy business. So far, the store has been a media darling, with food writers camping in its limited seating, slurping cereal and describing the rise and fall — and maybe rise again? — of the breakfast staple. The idea for the store was hatched in 2014, when cereal giant Kellogg's partnered with Christina Tosi — owner of New York-based bakery Milkbar and a judge on the television show MasterChef — for a pop-up restaurant in New York's tony Chelsea neighborhood. Tosi's gourmet take on cereal was simple — topped with berries, sprinkled with herbs like thyme and mint — but unexpected, and it led to the current store, for which Tosi designed the menu. Cereal, oddly, is the ideal format for experimentation, Di Capua says. "You're using a product that's very familiar, but we're pushing the boundaries of it," she says, noting that the typical milk-and-cereal combo is not what the store serves. In fact, she says the bar encourages wild experimentation and combinations of ingredients. Cereal sales, however, have been short of adventurous, sagging for quite some time now. Cereal sales peaked in 2011 at $8.5 billion and have been steadily declining since, according to consulting firm Lux Research. This is thanks in part to changing diets and lifestyles. No longer is sugary cereal heralded as "part of a healthy breakfast," as many ads used to suggest. Grains are often nixed in carbohydrate-free and gluten-free diets, sugar has become universally frowned upon, and Americans are drinking less milk than before. And then there's morning routines that have made breakfast seem like a luxury — The New York Times famously blamed millennials' distaste for washing spoons and bowls as one reason why cereal sales are slumping. Andy Shripka, associate marketing director for Kellogg's, is well aware of the mushy state of the cereal market, but he thinks that the industry is ripe for reinvention. "Cornflakes have remained largely unchanged since the late 1800s," he notes. "We want people to see it in a new light." After customers order at Kellogg's NYC, they are handed a buzzer that corresponds to a number on a door designed to look like a kitchen cabinet. Behind the door, a brown paper bag awaits with a bowl of cereal and an individual-sized container of milk. He points not just to Kellogg's offering of sundaes at its New York City store, but also to the current all-day breakfast concept that has proved to be wildly successful for McDonald's. If the public wants to eat Egg McMuffins all day long, why not bowls of Apple Jacks? Or better yet, Apple Jacks with a dollop of almond butter and dried cranberries? Last December, Kellogg's went so far as to create a "Stir it Up" campaign, which tapped chefs like Tosi to reimagine cereal, pairing it with surprising — oftentimes savory — flavors like nori seaweed, ginger and poached eggs. The idea was to challenge the perception of cereal as strictly morning fare. In fact, Kellogg's November investor meeting kicked off with CEO John Bryant offering his own take on a cereal meal, "The Kickin' Crunch:" Special K swirled with yogurt and avocado, sprinkled with cayenne pepper. The New York City storefront is part of Kellogg's overall strategy to revamp cereal's image, by encouraging experimentation. The most popular dish so far has been Cornflakes topped with pistachio, sprigs of thyme and lemon zest. To be sure, this isn't what your initial conception of what a cereal bar might be. The term "food bar" might conjure the model of a frozen yogurt chain, where customers select from an array of flavors, then head to a separate station to add as many marshmallows, gummy bears and other toppings as they see fit. The experience at Kellogg's NYC, by contrast, is less cafeteria/assembly line than a deliberate attempt to hark back to your childhood kitchen. After customers order, they are handed a buzzer that corresponds to a number on a door designed to look like a kitchen cabinet. Behind the door, a brown paper bag awaits (not unlike the kind Mom might have packed you for school lunch?). Inside is a bowl of cereal and an individual-sized container of milk from Five Acre Farms Milk, a New York-based dairy operation. The bill? For a "small" bowl — that's about the size of what you think of as a normal cereal bowl — it's $6.50. Sure, that might seem pricey considering that, as Di Capua notes, "I can buy a box of cereal and eat it at home." But she says customers aren't just getting locally sourced, seasonal ingredients, farm-fresh milk and gourmet flavor combinations. What they're really paying for, Di Capua says, is a whole experience. "We're constantly looking for experiences. It's the reason why we go to a bar for beer, to a coffee shop ... with friends, to dinner to have a bowl of pasta," she says. "It's because we're looking for something beyond just nourishment — we're looking for an experience. That's what we're doing here," she says. Kellogg's is hoping the bar experience will renew interest in cereal purchases at the store, too, by reminding customers that cereal can be malleable, able to go from breakfast to snack, to yes, even dinner. It can also be part of a refined dining experience, Di Capua argues. Indeed, at one point during the cereal bar's soft launch last week, it closed after running out of milk. Why didn't someone just dash to the corner store for more? "It's not the same!" Di Capua protests, a shocked expression on her face. For her, every element — even the milk — plays a part in creating a complete experience that touches on nostalgia while offering something new. On this sticky, humid July morning, it's quiet in the store, save for a family with a child eating a sundae sprinkled with Froot Loops, and two women huddling over a bowl of Krispix topped with banana. "It reminds me of Australia," says Shelda Kristie, 21, an Indonesian native who went to school in Sydney and is on vacation in New York. Her sister, Brenda, 23, nods in agreement — she went to college at UCLA and says that cereal was a staple between study sessions. The two were visiting the cereal bar for a second time and pondering another return before the end of their trip. When I asked if they'd grown up with cereal in Indonesia, Shelda and Brenda shook their heads. But then Shelda smiled, announcing, "But it's like my past, it's nostalgia." Tanya Basu is a writer based in Brooklyn. She's on Twitter: @mstanyabasu.